The trail to the Nez Perce camp at Big Hole National Battlefield. We still had to make our way towards Dillon, MT to pick up the carb that we had sent to the KOA Kampground there. On the way we wanted to stop to see Big Hole National Battlefield in Montana. The Big Hole Basin and the surrounding high peaks make you really feel like you’re entering a big hole going down into the basin. Near the northwest end of the valley is the battlefield, so we stopped at the visitor center, where they showed us a movie which took 5 years to research and explained what happened at Big Hole. A few tribes of Nez Perce Native Americans set up camp there for the summer of 1877. They were being chased out of their home in Idaho (I think) by the US army, which at that time was a mix of professional soldiers and volunteers from the countryside. Basically, the army was in charge of enforcing that the Nez Perce were sent to a reservation, however, some refused and were chased by the army. The tribes of the Nez Perce decided to camp in what is now the Big Hole Basin. There they hoped to be joined by the Crow, an ally tribe in Montana. But it didn’t work out because the army and a bunch of volunteers decided to ambush them at their camp instead, and basically kill them since they refused to go to the reservation like the other tribes. What happened at the battlefield in August of 1877 was so sad. The tribes were camped out near a river, which had tall willow bushes growing at its banks. The Indians built 89 tipis at their camp, and the army and a bunch of volunteers snuck up on them one night hiding behind the willow bushes across the small river from their camp. When the sun came up the next morning, one of the Indians went to the river to get water. An anxious volunteer soldier shot at the Indian out of excitement and stupidity, which set off the battle. The army just rampaged the whole camp, killing anything they saw, and set fire to some of the tipis. Mostly it was the women and children who died because they had no means of defense. The warrior Indians fought back and actually drove the soldiers off, wounding many. But it was too late because a lot of the Indians already lay dead in the camp. We took a short hike to the camp, where the bodies of the dead Indians still lay on the grounds. They didn’t even have a chance to bury the dead. Shortly after the battle, the Indians who were still alive fled and headed north into Canada. Some successfully escaped across the border but many didn’t. One of the Indians who was at the battle returned shortly after and was able to record what happened. The Nez Perce camp near a river. 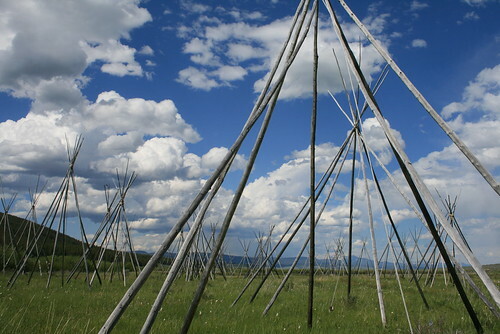 Tipi poles now stand where their actual tipis once were. 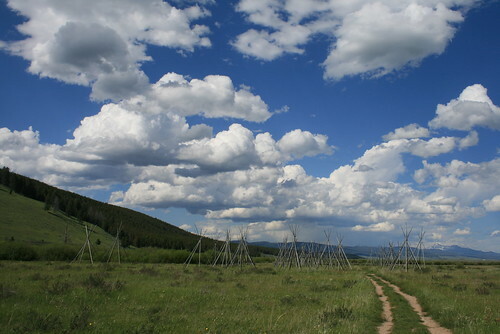 When we visited the site of the camp, there were some tipis placed there, with the Indian cheifs’ tipis marked. The locations I assume were estimated by the record of the Indian who returned after the battle, but I’m not sure. It was very sad to walk through the camp. And it was a very awakening visit, because I remember in grade school when the teachers who taught us about early American history talked of the Indian wars like it was okay or something. The events were never put into a negative light, and boys playing cowboys and Indians in the school yard was completely normal and most of the kids were rooting for the cowboy. The national monument was pretty empty with few visitors. I guess not many people care to visit places like these and learn about the past. Our visit made us think of that dark time in American history and how screwed up it was. It also reminded me of the grade school a few blocks away from our house in Berwyn. It used to be called Custer school, after General Custer. However, before we moved out to California, the name was changed to Prairie School (or something like that) because it was no longer politically correct to name a school after a general who really should not be so praised. Kind of like having a school called Hitler school or something I guess. 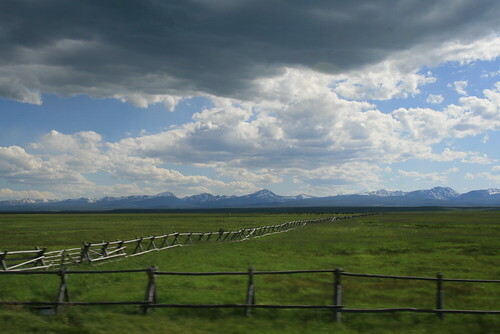 Driving by a farm with a traditional wood fence in the Big Hole Basin. Our mood started to lighten a little as we drove on through the Big Hole Basin, and then over the pass at the southeastern end. We were getting closer and closer to Dillon, and the sun was starting to make its way westward. As we entered the Grasshopper Valley, we saw a brown sign that read Elkhorn Hot Springs 14 miles. So we turned at the sign and headed towards the hot springs to check them out. If it was cool, we figured, we would stay and camp near the springs. If they sucked, we would turn around and go back towards Dillon to camp at the KOA which had our carb waiting for us (this time the correct one we hoped). Well, we drove up along the Grasshopper Valley and then up some switchbacks and into a small resort which was looked over by the National Forest. The hot springs were completely natural, but piped into two big swimming pools next to a bathhouse operated by a private resort. The pools looked very low-key, not fancy at all, and only a small group of people were there. We recognized them as one of the only other people we saw earlier that day at the Big Hole Battlefield! The pools were hot, and we needed to bathe after camping for a few days without a shower or anything and it was only $6 per person. So we got our bathing suits on and hopped in. Me and Nicole swimming in the hot pool at Elkhorn Hot Springs. To our surprise, alcohol was allowed as long as you drank it in a plastic bottle or plastic cup (no glass allowed), so we got out our box of Vella cabernet sauvignon wine and plastic party cups and brought them to the poolside. Half of the pool was very deep, so deep you could swim normally, but of course, after some wine we decided to stick with the shallow end! The mosquitoes were out in force, so we ended up having to keep our bodies mostly submerged and dunked our heads under the water periodically to drive them off. What a nice treat to be soaking in some hot springs! After we had enough (due to the heat and alcohol) we showered and were on our way to find a campsite. The springs were in the National Forest already so we just found a dirt road a mile or so away from the resort and started driving down it. Eventually we found a section of the road that leveled out (we were deep in the mountains by now) and also had a small clearing. We found that somebody already made a firepit so we collected wood and tried to smoke out the mosquitoes. This was the only place so far where we had to deal with any bugs, and I guess we were pretty spoiled. But after starting the fire and trying to make it really hot, most of the mosquitoes stayed away. As the sun went down and the air cooled off, the rest of the mosquitoes left us alone. 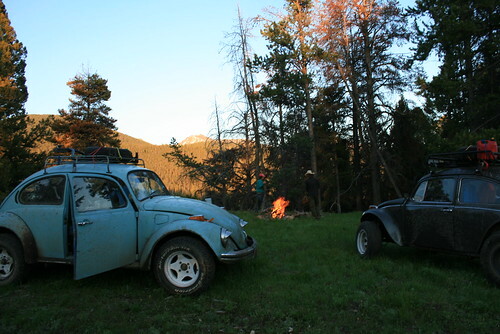 A campfire to drive the mosquitoes away in the Beaverhead National Forest. My New Desk in McCone!